This post provides details on the malicious Mac process called Maftask, explains what it has to do with Mac Auto Fixer virus, and includes removal steps. Underestimating the capabilities and complexity of Mac malware is a slippery slope. The threat actors who zero in on the Apple ecosystem are becoming increasingly tech-savvy, and their malicious code can assume different shapes to evade detection and prevent termination. Mac Auto Fixer, one of the fairly sophisticated samples from that category, injects its tentacles deep inside a host system and sprinkles concomitant files and processes in order to persevere. Some victims fail to notice these extra fragments of the infection, but those who look for them typically spot an executable file named “maftask”. It is listed among the running processes in the contaminated Mac’s Activity Monitor, and another entry “com.techyutil.maftask.plist” is going to end up in the LaunchDaemons. So, the actual culprit’s name is Mac Auto Fixer, and it’s embodied on the system level as the Maftask process – no wonder some users refer to the latter as the troublemaker. The conspicuously misbehaving application is a mix of a rogue optimization tool and pseudo security software. It pretends to find a bevy of macOS performance issues as well as privacy and malware problems, thus attempting to persuade the victim that purchasing its license is certainly on their to-do list. It boasts sleek GUI design and triggers trustworthy-looking system scans over and over. The reports enumerate hundreds of items that should supposedly be deleted or fixed at once, including duplicates, unnecessary login items, failed downloads and memory issues. 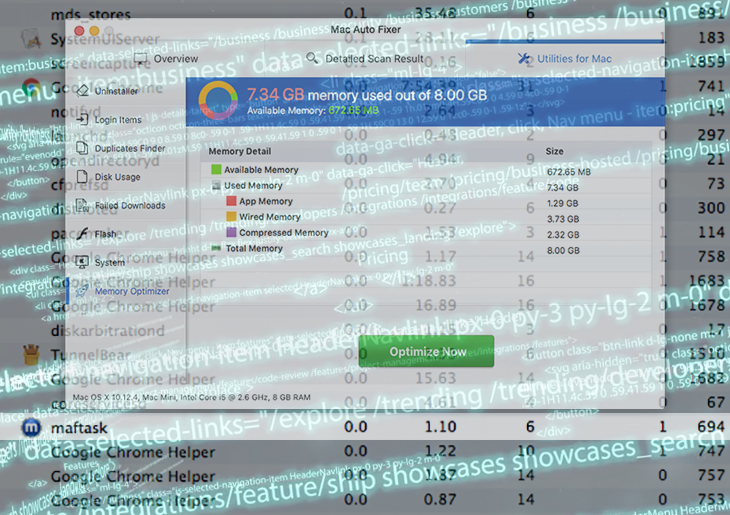 To top it all off, the Maftask virus will state there is too little available space left and urge the user to have memory released in one click. The pseudo scanning activity of Mac Auto Fixer (Maftask) malware is accompanied by numerous popups that further pressure the user into taking immediate action. The alerts typically mention the number of threats and issues spotted in specific system areas and recommend the victim to sort them all out by registering the full version of the program. The infection can also impact the web surfing facet of Mac usage by rerouting traffic to spoof warning pages. Long story short, Maftask deploys a great deal of brainwashing to dupe and intimidate the owner of the infected computer into coughing up a registration fee. Therefore, following those annoying prompts is a bad idea because most of the problems are phony and the only real adversary is the alleged Mac performance booster itself. The Maftask virus penetrates into a Mac by means of tricky installation clients. Their nasty gist boils down to combining benign apps with harmful ones under a single umbrella. The regular program is the only one clearly indicated in the setup wizard, while the Mac Auto Fixer baddie lurks down in its settings that you have to spend time toggling. In summary, Maftask is a component of a dangerous and obnoxious Mac scareware, so it should be treated accordingly. Continue reading this entry to learn how to remove the pest. When confronted with malicious code like the Maftask virus on Mac, you can neutralize its toxic impact by leveraging a specially crafted system utility. The Freshmac application (read review) is a perfect match for this purpose as it delivers essential security features along with must-have modules for Mac optimization. This tool cleans unneeded applications and persistent malware in one click. It also protects your privacy by eliminating tracking cookies, frees up disk space, and manages startup apps to decrease boot time. On top of that, it boasts 24/7 tech support. The following steps will walk you through automatic removal of the Maftask infection. 3.The scan report will then display your current system health status and the number of issues detected for each of the above categories. Click the Fix Safely button tto remove junk files and address privacy issues spotted during the scan. 4. Check whether the Maftask issue has been fixed. If it perseveres, go to the Uninstaller option on Freshmac GUI. Locate an entry that appears suspicious, select it and click Fix Safely button to force-uninstall the unwanted application. 5. Go to Temp and Startup Apps panes on the interface and have all redundant or suspicious items eliminated as well. The Maftask malware shouldn’t be causing any further trouble.